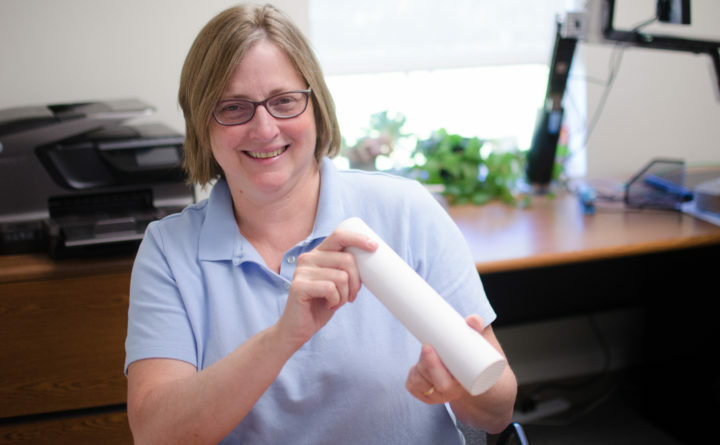 Susan MacKay, CEO of Cerahelix Inc. of Orono, with one of the high tech ceramic filters the company makes. The company attracted $2 million in new financing Tuesday, which it will use to expand manufacturing and hire up to four people. An Orono company that uses nanotechnology to make a new type of high-tech filter to purify liquids will complete a $2 million round of investment Tuesday that it will put toward leasing new manufacturing space and hiring up to four people this year. The investment is being led by PureTerra Ventures, a Shanghai, China, venture capital fund with Dutch management that focuses on water technologies. Also investing are the Maine Venture Fund and Propel(x), a San Francisco angel investment group. Angel investors put their own money into an entrepreneurial company. “This money will be used for our planned manufacturing expansion, increased sales and marketing activities, and to support our current operations,” Susan MacKay, CEO of the seven-year-old company Cerahelix, said. The company makes a high-tech filter with pores that are 100,000 times smaller than the diameter of a human hair. They can separate solids such as sugar or salt to produce highly pure liquids, such as in desalination of salt water for drinking water, according to MacKay. In a separate application, the filters also can isolate and capture molecules that chemists and others can use. Cerahelix, located in the UpStart Center for Entrepreneurship in Orono, currently employs nine people. It plans to lease another 1,500 square feet of space at the Bangor Innovation Center starting in April. It will locate its coating fabrication and production equipment there and produce its ceramic membrane filters. MacKay said her goal was to raise $2 million, but she is leaving the door open for other investors who have expressed interest but are performing due diligence to see if they want to join the deal. Including today’s investment, Cerahelix has raised $3.9 million since it started in 2011. MacKay would not give exact revenue figures, but said early sales are in the low six figures.